I found this guy through TripAdvisor. In just a few months, he's somehow become the number one attraction listed in San Diego. 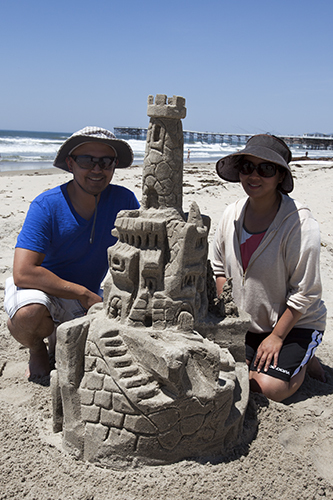 It's not cheap, but JT Estrela's sand castle building lesson is a great way to spend three hours on the beach. We got there a little earlier than our 10am start time and lucked out on free parking on Thomas Ave. If you're in a pinch, Joe's Crab Shack has parking for $5. It's easy to figure out who JT is—just look for the dude with all the buckets! We opted for collaborating on a single castle instead of doing our own individual smaller ones. We picked out a spot to create our masterpiece and we got to working. 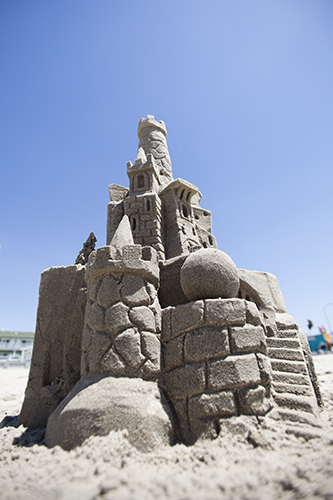 Yes, building a 44-inch sand castle involves work. You'll need to lug buckets of sea water from the, uhh, sea. 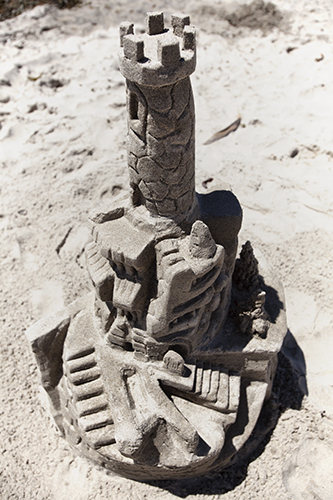 You'll need to shovel sand into the forms. You'll need to pour sea water in and mix it up to make sure there are no dry spots. You'll need to tamp that wet sand down. Repeat. Then comes the fun part. 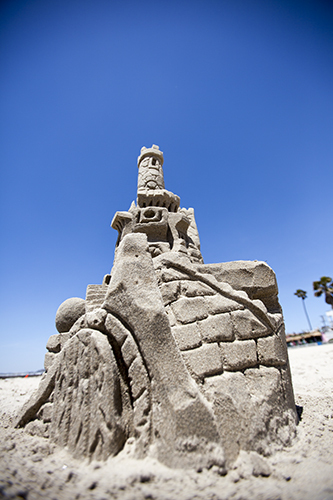 Now that you've got your sand foundation, the sky's the limit. Actually, the ground is the limit. You carve and sculpt from the top and work your way down. JT will give you awesome tips and secrets on making the various features—doors, windows, stairs, brick, stone, crenellations (I learned that word from JT), drip trees, and even a ball! I'm sure you will have a ball just as we did. By the end of our three hours, we decided that we had enough and were happy to quick finish our castle. It still ended up fantastic. If you have excess energy, though, JT is happy to let you borrow the tools to complete your architectural wonder. Here we are for scale.